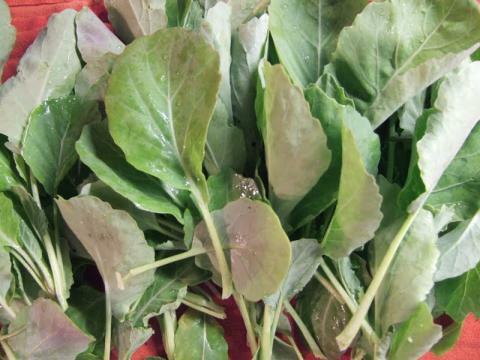 ​Note: The ideal size for the collards is 9 inches long. If substituting longer leaves, blanch them longer and continue to sauté them until tender adding more stock if necessary. Blanch the collards for 30 seconds in a large pot of salted boiling water. Drain,then quickly transfer the leaves to an ice bath(water with ice cubes). As soon as they are cold, drain again and gently squeeze them with your hand to remove excess moisture. Transfer the collards to a medium bowl and toss with your fingers to separate the leaves, adding the soy and sesame oil and continue to toss to cover all leaves. ​Heat the vegetable oil in a medium pan over medium-low heat. Add the ginger and chiles. Sauté for a minute, until ginger is wilted and fragrant but not colored. raise the heat to medium and add the collards. Season with salt and toss to coat and incorporate the ginger and chiles. Add the chicken stock and cook, stirring frequently, for about 3 minutes, until greens are very hot. ​Season with additional salt to taste and serve.